2. Photo of Mayor Bossy Gillis’s grave from a few angles and approximate location within St Mary’s Cemetery on Storey Ave.. I need this for a future post! You can upload it or email me questions at nbptma.com. Thank you! Photo credit will be given. Thank you JOHN FROST for photographing the tombstone of the Coolest Cat In Town! This entry was posted on Monday, October 27th, 2008 and is filed under . You can follow any responses to this entry through the RSS 2.0 feed. You can leave a response, or trackback from your own site. Melvin Russell use to chase the girls around and say I want to Buck you in the bushes!!!! he was scary when you were little but as you got older you realized he was harmless. And I and My son was born In the anna jaques hospital,almost in the same room 22 years apart. Love me some N.B.P.T> another quote that all the hippies who hung in front of the ymca was LOVE is the word!!!! Hi Jim I will check it out! Oh my goodness! 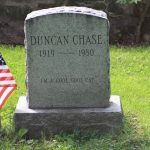 I just saw this and am psyched that Duncan got a nice grave stone. I have fond memories of Duncan breaking the jewelry store window in the winter so he would get arrested and be put in a ‘warm’ jail cell during the winter. What a sweet drunk he was. Thanks for posting this!!! Duncan will always be a ‘Cool cat!’ in my book.